Yeah, this falls under “unclear on the concept”. Problem #1: Half my Twitter followers (ascetics / vegetarians / intellectuals), only do it because @Havi put me on a list. And I can guarantee they don’t want their iPhones gummed up with endless tweets of my eating excesses. Problem #3: It takes me ten ridiculous days to write a post. Researching Seattle from the room instead of out exploring. Duh. And on the iPhone to-boot rather than paying $9.95 for access that’s only valid til 3 pm. 5 more Starbucks spotted on the way to a corner grocery. Bud and peanuts await mah man’s return for swanky cocktails en suite. V nice 10th floor corner room at the Paramount. Recommend, aside from the annoying connectivity (even the iPhone needs continuous log in). …1) artichokes, proscuitto, baked egg; 2) duck proscuitto, pickled apricot, arugula; 3) baby lettuces, radish, muscatel vinaigrette. I’d recommend for the salads, vibe, pizza as a snack, and e-z proximity to downtown. Breakfast a bust. Typical in-room coffee (can you say “coffee-mate”? mmm. When I open MY hotel, the honor bar will be stocked with free cream). Llandro “bakery” and cafe across the street has no baked goods to speak of. Out in the 3-D world. Hooray! Belltown is deserted and more…barren?…than expected. So many “For Lease” signs, ouch. There’s Lola, Dahlia Lounge, Flying Fish, but I’ve got my eye out for Macrina Bakery recommended by a local friend…voila. Adorable. Small cappucci off to a shaky start, though it would be a good tiny latte. Coffees in Seattle? 4. Great coffees? 0. Semi-related pet peeve: not correlating # of shots with the size of the cup / milk. 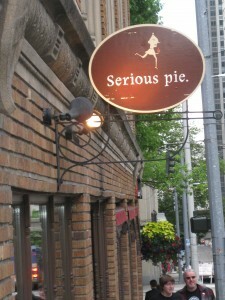 Especially places that should know better (Pdx Bar-cough-ista). Hmm, sandwiches were recommended but I’d rather sample more variety. Quiche velvety, liquid-feeling eggs that hold together beautifully. How’d they do that? Piadina (proscuitto & cheese in toasted flatbread) so-so. Indifferent service but nice stop. Rawhrrr! 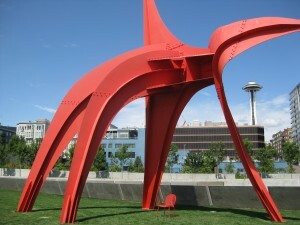 Calder’s Eagle eats the Space Needle. “Help! We paid $16 to get up here and now I’m being…a-a-aiyee!” Chomp chomp chomp. Oldenburg (and Coosje van Bruggen)’s Typewriter Eraser. If you’ve used one of these raise your hand. Time for the nursing home for us. “Racing” down to erase the freeway and cars. 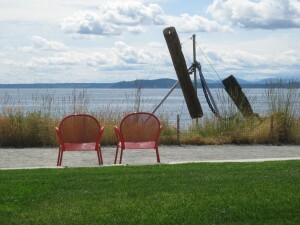 Love the Sculpture Park, but the red chairs are my favorite thing. What a bumpkin. Piers to my right, freeway, parking structures and self-storage to my left cutting off town from the water. Like the Embarcadero pre-quake. Finally, a free bus the last 6 blocks to Pioneer Square. Blessed shade. Bricks, ivy, trees, this is how I pictured Belltown for some reason. More “For Lease” signs but a great stop for a cool beverage. #Sanbitters. A crochet lesson. “Hey, I’ve never done this before!” as I’m busted taking his pic. I’m not here to judge you, sir. 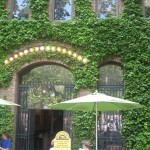 I resist going into Grand Central Bakery, despite the inviting ivy-covered walls. International District looks bleak. Too tired to see if I’m missing some magical street so it’s Uwajimaya and out. Even I can’t muster up the appetite for kalua pork at Aloha Plates or noodles at Samurai. What good is an enormous belly if it can’t rise to the occasion?! Four hours to get here, three minutes to free-bus it home through the tunnel. Sweet. Poor monorail, so worn and dated. Seattle Center public spaces not bad on a warm evening. I wander as K and the convention ‘swells’ swill drinks at a $50 gala. Chef Ken-san Yamamoto, marry me? 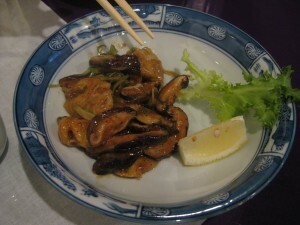 Geoduck & shitakes in butter…[insert Homer’s drooling sound] Tempura shrimp heads! Toro! Sake! Hamachi! Amaebi! Ikura…and another Hamachi for dessert. Thank you Yelp. I take back all the bad things I was saying about you. We should have bbq pork bao for breakfast every day. Is there something about the water in Portland that renders them impossible to make? Even this day-old guy is spectacularly yummy. Like a donut…with meat. With two special exhibition galleries closed for changeover, the SAM seems like the perfect size for 3 hours. Intriguing contemporary, quality “old stuff” without the filler (IMO) of PAM. 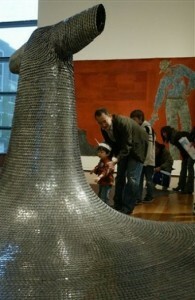 Artist Do-Ho Suh’s “military dogtag” robe spectacular. I love this whole contemporary section. Titus Kaphar exhibit an oversized gem of wit and tragedy. Why an atheist is so drawn to the religious paintings of the Renaissance is a conundrum worthy of some prayerful meditation. Wall-filling South African video “Shadow Procession” riveting. “Things that seem whimsical, incidental, inauthentic may be trusted to provide entry into the heart of one’s material.” William Kentridge, artist. 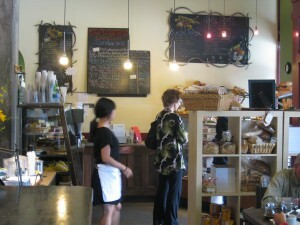 From the visually stimulating SAM to Cafe Campagne’s palate stimulating oeufs en meurette. Sublime poached eggs on brioche, a-swim in a sauce of pearl onions, pancetta, wine and emulsed foie gras. The less said about the sad croque monsieur, the better. Fortunately the eggs and accompanying pommes frîtes to swab up the sticky, rich leavings are (rich) enough for two. #didImentionit’srich? Fortified, we enjoy the new downtown library. 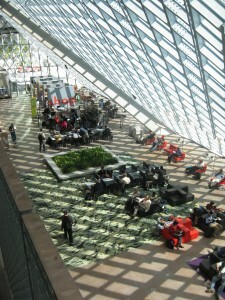 Agreed: the atrium is spectacular & the womb-like meeting room floor interesting. K admires the moxy, I worry about how this slanty / slopey / tilty building will wear. I seem to have shaken off my identification as a San Franciscan. Comparing Seattle more often to Pdx, and home is coming off very favorably. That’s a nice realization. If a martini says, no returns on the menu, how stupid does one have to be to order it? Kaya Korean: A tragedy in 2 acts. The Hero? 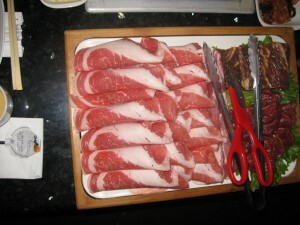 Spectacular meat at good prices. The downfall? Hubris (appalling service leads to missing panchun & lack of flavor.) The victims? 4 of us who drove to fumbuck Aurora on a rainy night. SO sorry, J&J! Steak, pork belly, and a few kalbi. How could something so right turn out to be so wrong? We try to salvage the night with much-vaunted donuts at Dahlia Lounge. Coconut pie more successful. Comfy space to relive the evening’s indignities. 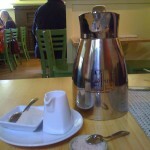 Brunch at Tilth nearly washes away the bad taste of last night. Charming, light yet flavor-packed, first good coffee I’ve had in Seattle. Very good, and they left the pot. The kitchen was backed up and we didn’t even care. Sous vide eggs on a crab benny…scrumptious. 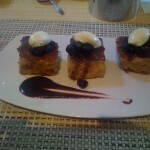 French toast more like mini squares of unctious bread pudding…perfect to share. Even the oatmeal was delicious. Oatmeal, for crying out loud. This is where J wanted to eat last night. Guilt over Kaya settles even deeper. Pike’s too crammed; should have come at 7 am. I recall my 16-year-old self’s visit here in minute detail. If only I’d known what to do with the bolt of energy that hit me as I wandered the food-laden halls lo those many years ago. Delighted to see friends on Bainbridge Is. I feel like I’m in a Crate & Barrel photo shoot: beautiful people, charming children, glorious old farmhouse dusted lightly with impeccable taste. Even the neighborhood dogs gather here to play. Dinner at Quinns, brother (literally) to Restaurant Zoe. Nice gastro-pubby (loud) space, the beer list and our waiter’s vast knowledge of said list truly impressive. Not a wrong note on the menu, but execution…. If there’s a next time we’ll try the steak tartare and sloppy joe. Worth another trip for that and beer. Appreciate our thin, healthy local friends’ ordering compromises; left to our own devices we’d be dead under the table. Saw my first twirling pasties at the Pink Door! And at my advanced age…sad really. 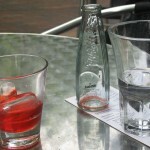 Drinks pretty awful. Oops, another ferry to Bainbridge missed. Damn you bus #70 and your screwed up schedule! It’s too hot to be dragging a suitcase a mile down SE 17th. I’m giving Seattle a B / B-. 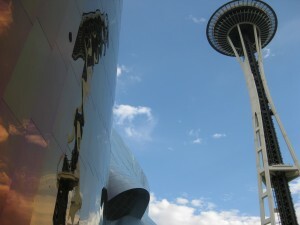 I give MY visit to Seattle a B/B-. There are treasures a-plenty to be savored, I’m sure. Will try again (and next time I won’t fight restaurant recs just because they sound too predictable). Ditto the Salumi recommendation. And if you take the morning train, it gets there just in time to walk the four blocks to Salumi for lunch! didn’t I say you should have gone to….oh, never mind. Like I’ve never had those kinds of experiences on various travels. Thanks for sharing, I feel like I’ve been on a short trip. You just saved me lots of $$!! You do tend to write quite a bit but I still find interesting! Great pictures of food & library. I agree w/K on moxy of library and it is probably awesome when raining hard. Need tips on places to eat in Berlin but after your Seattle experience are you up for the challenge!! 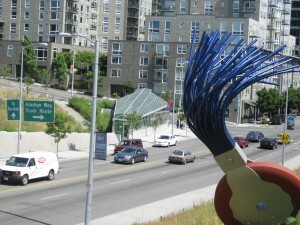 LOVE the typewriter eraser sculpture! Brings back not so fond memories of my days as an underage office girl. Must check it out next time.